I have very fond memories of North Street, as it used to be. For some reason, my associations are mostly with winter days, when the shops and lights seemed so cosy and welcoming. My earliest memories are probably of the Christmas Grotto at Hanningtons in the 1950s – what a magical experience for a young child. My mother and I also regularly met my grandmother on winter afternoons in the Lyons teashop, which was, as I remember, fairly near the Princes News Theatre. In Lyons teashops, you could get delicious things like poached egg on toast – perfect for a cold winter’s day. In the summer, we met up outdoors at the Pavilion Gardens tea place. 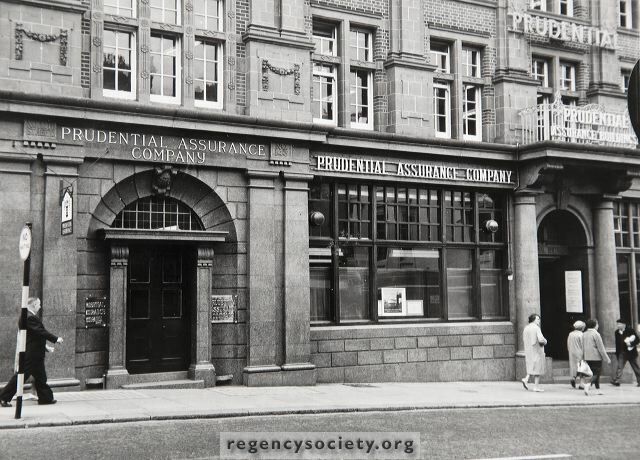 In the 1960s, when I left school, my first full-time job was at The Prudential, a big red brick building on the left side as you went towards Castle Square. I remember looking out of the windows as it got dark on winter afternoons, and watching the street lamps and the shop windows light up. While I worked there, we moved into a new building a bit further down the road and then had the strange experience of seeing our old offices demolished, with those big swinging spherical balls that crashed into the walls and knocked them down. Later, I worked at the District Bank, also in North Street, on the same side, which I don’t think exists any more. The shops in North Street were wonderful. There was Hanningtons, as I’ve mentioned, and Vokin’s, where you could buy cheerful cotton fabrics to make skirts or dresses – often for a compulsory Domestic Science project at school. There was always a wonderful display of fabrics, most of them beyond the range of my pocket in those days. Vokin’s had one of those vacuum tubes (if that’s the right term) where the bill and your money was whooshed away overhead and your change came whizzing back a few minutes later. Happy Days. Do you remember North Street in the 1960s? What shops can you remember? If you can share your memories with us, please leave a comment below. I remember a great fashion shop near the bottom of North Street. In 1964-5 I bought a pair of leopard-skin trousers and a tunic top to match. I thought I was the bees knees in them! Can’t recall the name though, it was on the left as you went down. My first job was in the Accounts Dept. of the Prudential in 1962-66. I really enjoyed the work and all the girls in the department – we had a lot of laughs. I remember the old fashioned lift, and getting stuck between floors on one occasion. I’m still in touch with my friend Marion and often wonder what happened to Carole, Margaret, Hilary and others. I remember the Wimpy Bar across the road and also the coffee bar on the street across from the Post Office (I do not remember the name). Also delicious sandwiches from a deli just up from the Clock Tower. Having all the shops in Western Road so close at hand was a teenage girls dream and I do not think my wages lasted too long – after I paid my parents of course.